To access these chat rooms you need Java installed on your computer. In the unlikely event you do not have Java installed you can download it from: http://www.java.com. When connecting to the depression chat rooms you will be confronted with one (or two) Pop Up Windows. Please select the options highlighted in red to successfully connect to the chat rooms. If you want to learn more about our Java chat system and its security, please visit: http://www.pjirc.com. Almost all other connection issues can be resolved by reloading the page (CTRL + F5), or restarting your computer. If however you find you still can't connect, please read the instructions at the bottom of this page. 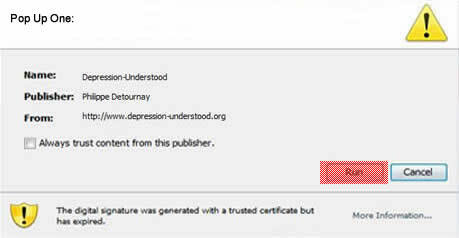 Copyright � 2010 Depression Understood. All rights reserved.